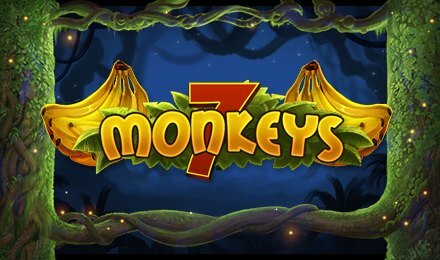 Made with 5 reels and 7 paylines, 7 Monkeys slots is the newest creation of Pragmatic Play. This game’s background shows a jungle which is made of colourful monkeys, which can lead you to winnings. As you travel through this jungle, you will come across a variety of features like bonus rounds, wilds and scatters. The colourful symbols to be seen on the reels are orange monkeys, green monkeys, pink monkeys, yellow monkeys, blue monkeys, bananas and rainbow monkeys. This game consists of many tabs which you can make use of, for an easier gameplay. The most advantageous option is the auto-play. This tab lets you select few number of games to be played on auto mode while you can chill and admire the top graphics. Amount of Paylines Selection: The 7 paylines are fixed on this game. Coin Values:The coin denominations vary from £0.01 to £50.00 on this game, and you can select your preferred bet. The Rainbow Monkey acts as wild on this game. It has the power to replace any other symbols, apart from the scatter. The Banana symbol is the scatter of this game, and it can award the free spins round.